The promise of democracy is that all people have an equal say in their governance. As such, the amount of money we have, the color of our skin, the neighborhood we live in, and our ability level should not make a difference when it comes to our right and ability to exercise the right to vote and participate fully in our democracy. When it comes to casting a vote, all people should have equal access and equal voice. Unfortunately, when we dig down into the data, it’s clear that the promise of equal access has yet to be realized. In every corner of our state, an examination of publicly available data paints a disturbing picture of unequal access to the basic mechanisms of democracy. Simply stated, the less privileged a segment of a Kansas community, the lower their participation in our democracy. The first step towards voting is registering to vote, and a striking disparity emerges by comparing rates of voter registration across several demographic variables. Demographics and population counts came from the 2011-2015 American Community Survey (ACS) published by the United States Census Bureau. Counts of registered voters came from the Kansas Secretary of State voter file, accessed November 19th, 2015. All analyses were done at Kansas House District level. Kansas has 125 House districts. Each of these districts, by design, represent approximately the same number of people. 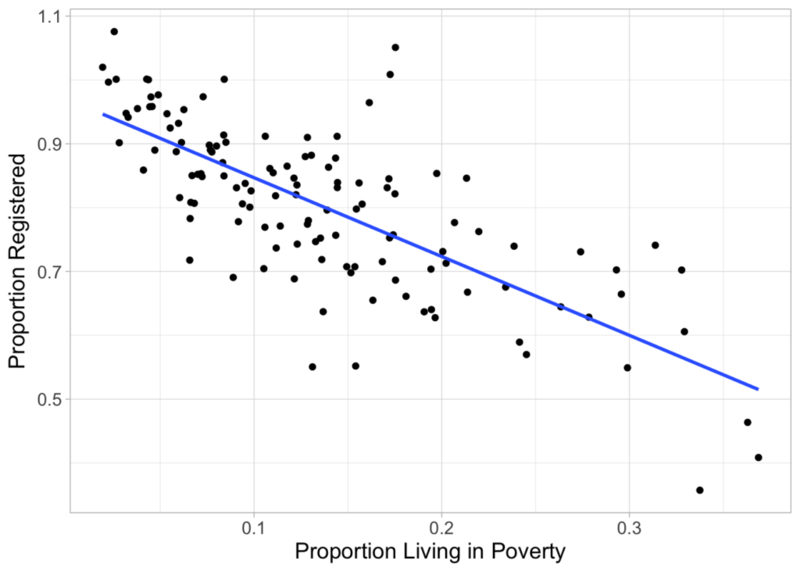 Poverty, defined as the proportion of people in the district living below the poverty level. Race, defined as the proportion of people in the district who are White. Education, defined as the proportion of people in the district with a Bachelor’s degree or higher. Disability, defined as the proportion of people in the district with a disability. Detailed definitions for these four variables can be found by clicking on the dashboard link above, then choosing Demographics, then Variable Definitions. As poverty increases, registration sharply declines. As evident in the chart above, the proportion of voting age population registered correlated strongly with proportion in poverty (r = -0.74). As poverty rises, registration falls. Communities with higher numbers of racial minorities are more disenfranchised than white communities. 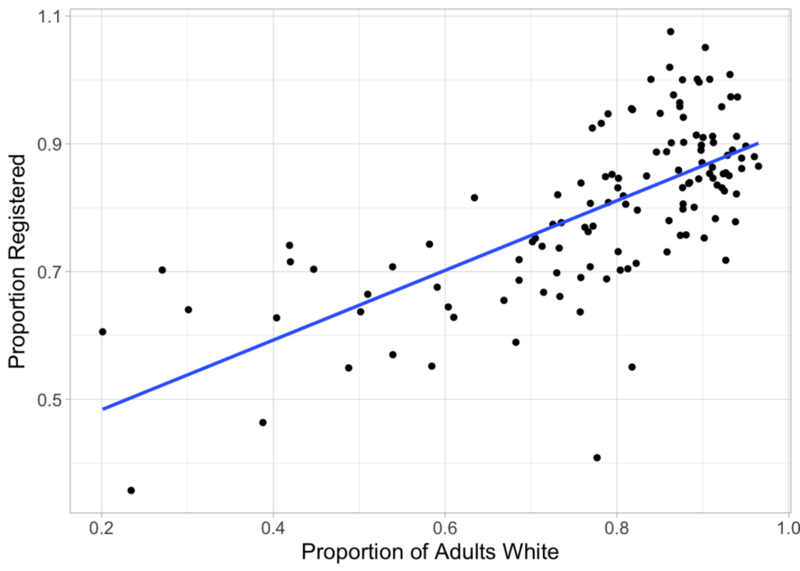 The “Whiter” a district is, the more voter registration increases (r = 0.68). As education levels decrease, so does voter registration. 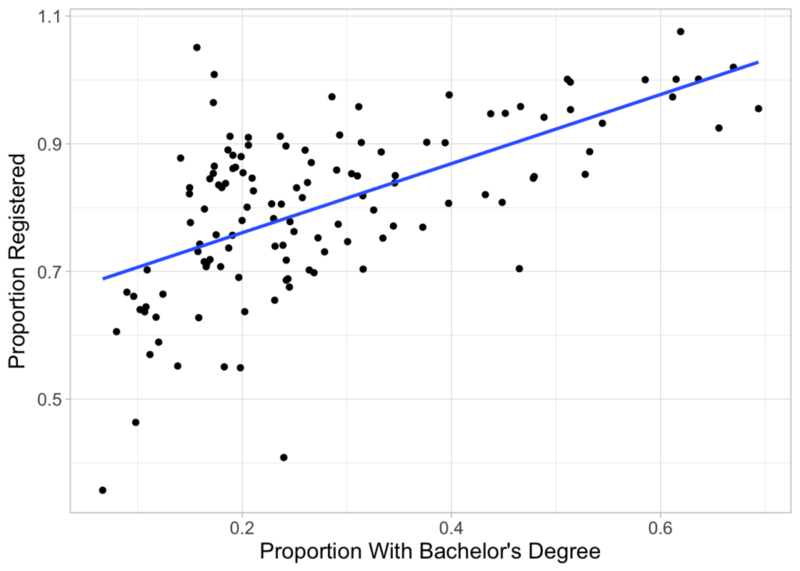 Districts with a higher proportion of residents who have obtained at least a Bachelor’s degree are much more likely to be registered (r = 0.60). Rates of disability likewise affect registration. 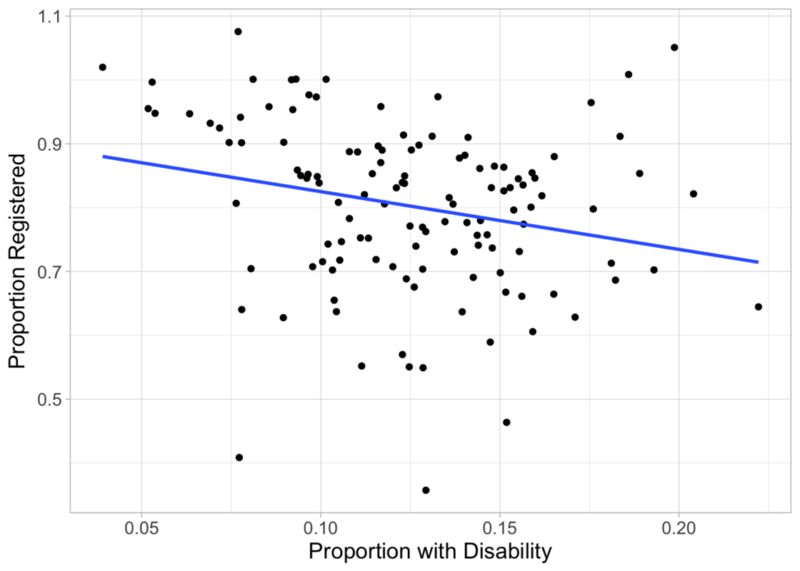 At a less severe rate as the other indicators we see, though still statistically significant, those districts with a higher proportion of individuals with disabilities show lower voter registration, as well (r = -0.24). When taken independently, each of these indicators—poverty, racial minority level, lower educational attainment, and rates of disability—show a significant disparity when it comes to voter registration. One might think that one of these variables could account for other ones; for example, is the relationship between race and registration due to poverty? Even when considering all of these four variables simultaneously in a regression equation, all four predictors are significant predictors. This means that the relationship between poverty and registration was not due to differences in race, education, or disability; likewise, the relationship between disability and registration was not due to differences in race, education, or poverty. You could say the same about race and education, as well. This disparity affects every corner of our state. Remember that, by design, every Kansas House district should represent the same number of voters. We see a very different picture emerge when we examine voter registration rates across districts. Due to these disparities, some districts effectively have almost half of the electorate as their more enfranchized peers, meaning some votes in Kansas have a greater impact in shaping our state. You can see this on the map below: The darker the shading, the higher a house district’s proportion of registered voters. Registering voters is not rocket science. It takes time and resources, but we know how to do it. By focusing on the areas of greater need, Kansas communities can make an investment in the very foundation of our state and make steady progress towards the promise of democracy for all.